GOP debate demands: Equal time, two hours, 67 degrees. 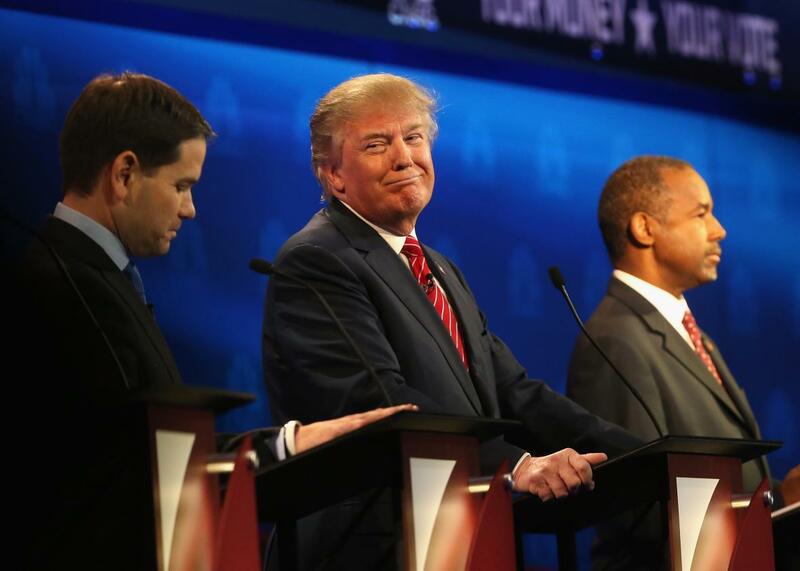 Donald Trump smiles while Sen. Marco Rubio and Ben Carson look on during the CNBC GOP presidential debate at the University of Colorado on Oct. 28, 2015. The Republicans on stage at last Wednesday’s CNBC debate didn’t wait until it was over to start complaining about how it was run. Now they’re banding together to try to do something about it. Advisers to a majority of the GOP hopefuls met on Sunday at a Washington, D.C.-area hotel to hash out a list of demands for how they want future debates to work. The final list is still a work-in-progress, but the biggest ticket items on the current wish list reportedly include that the networks cap the debates at two hours, do not have a “lightning round” of questions, give candidates the chance to make opening and closing statements, and provide equal speaking time to each candidate. Many of the other requests discussed at the meeting were smaller bore in nature, including that the networks give campaigns final say over on-screen biographical graphics displayed while the candidates are speaking (Jeb Bush’s campaign was particularly unhappy when one CNBC graphic listed his work as a banker but not his time as governor); do not ask candidates to raise their hands to answer a question (as Fox News did when it opened the first debate with a Donald Trump–targeted question about potential third-party runs); do not ask a yes-or-no question without also offering time to provide a “substantive answer”; and promise to keep the temperature in the debate hall below 67 degrees. For now, the big and solidified change is that the campaigns will no longer allow the Republican National Committee to serve as a middleman between themselves and the networks. That’s a bit of an embarrassment for the RNC, which inserted itself into the debate process this year in hopes of avoiding the chaotic debate process that dominated the 2012 primary campaign. Thanks to the ratings bonanza the first three GOP debates have been, the campaigns have a good deal of leverage to work with. Still, it remains to be seen whether they’ll be able to stick together in the long run given their competing interests. Bobby Jindal and his fellow debate understudies are desperate to get into the prime-time event; the Rand Pauls of the world are equally determined to hold onto their spots on the edges of the main stage. Donald Trump can’t stand the idea of a debate that lasts more than two hours; Bush and other second-tier candidates have complained that they’re not getting enough time to talk. Most significant changes to the format, then, would benefit one set of candidates at the expense of another. Even general agreements between the campaigns could fall apart when their bigger demands move from theory to practice. Take the request for speaking time parity among the candidates, which the latest draft of the letter phrases as a question: “Will you commit to provide equal time/an equal number of questions of equal quality (substance as opposed to ‘gotcha’ or frivolous) to each candidate?” To state the obvious: “equal time” and “an equal number of questions of equal quality” are two very different things (and the second involves a highly subjective call). But even a promise of equal time will be incredibly difficult to honor. In the much-maligned CNBC debate, Carly Fiorina got the most time (10 minutes, 13 seconds) while Rand Paul got the least (6 minutes, 22 seconds). But a large reason why Carly topped that list was because toward the end of the debate she began jumping in even when she wasn’t called on. The rest of the numbers were also skewed because candidates named by a rival were allowed time to respond. Given the campaigns will likely want that practice continued, it would be hard if not impossible for the moderators to guarantee equal time.